This DEWALT 6 in. Large Trigger Clamp is intended for use with one handed operation jobs. The clamp converts to a spreader and with its removable jaw pads it protects work surfaces. The tough re-enforced nylon body makes wear and tear difficult. 6-Inch. 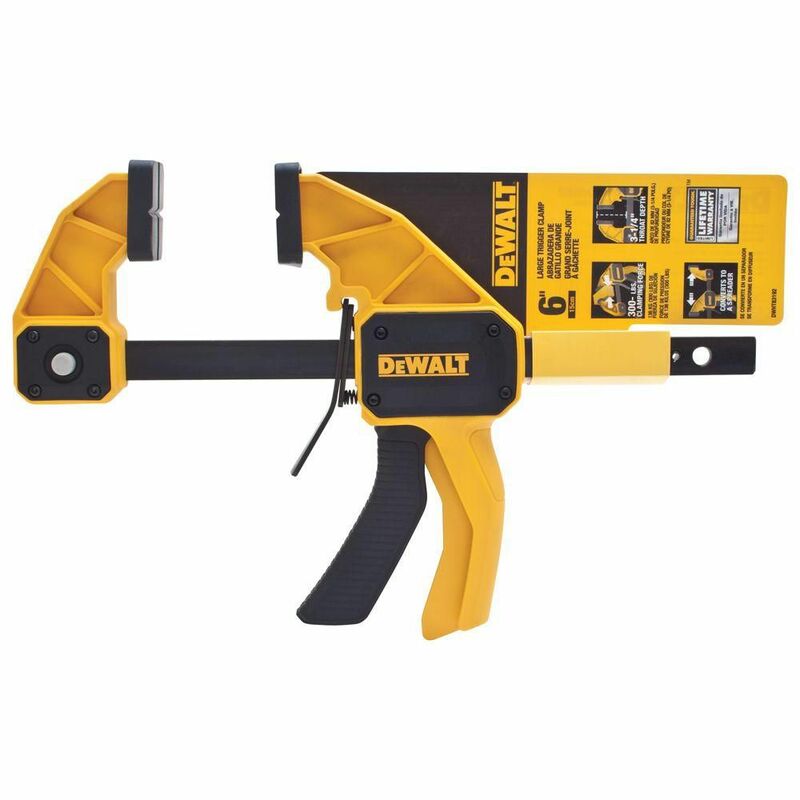 Large Trigger Clamp This DEWALT 6 in. Large Trigger Clamp is intended for use with one handed operation jobs. The clamp converts to a spreader and with its removable jaw pads it protects work surfaces. The tough re-enforced nylon body makes wear and tear difficult. 6-Inch. Large Trigger Clamp is rated 4.6 out of 5 by 54. Rated 5 out of 5 by RT from Works as advertised. Helped a great deal for installing cabinets.... Works as advertised. Helped a great deal for installing cabinets. Rated 5 out of 5 by Blas from They work excellent. They were very helpful installing kitchen cabinets.... They work excellent. They were very helpful installing kitchen cabinets. Rated 5 out of 5 by HomeDepotCustomer from Solid tool by a known tool maker---win win!... Solid tool by a known tool maker---win win! Rated 5 out of 5 by MiloTX from Had to glue a crack in our closet door. ... Had to glue a crack in our closet door. Needed something to really hold the door together as the wood glue dried. This tool worked as planned. Clamps very tightly. Rated 5 out of 5 by Jonny from I purchases this clamp, because I was looking for something strong enough to squeeze together som... I purchases this clamp, because I was looking for something strong enough to squeeze together some custom door hardware. I don't need anything longer than 3"... but, most of the shorter clamps are very weak. This does the job!